SNAFU! 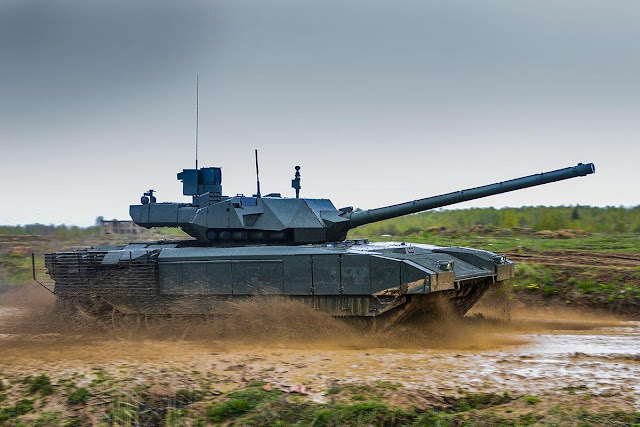 : India is interested in the Armata MBT? India is interested in the Armata MBT? via Economic Times of India. The Indian Army is looking to procure 1,770 multipurpose future ready combat vehicles (FRCV) to replace the aging force of T-72 main battle tanks (MBTs). Russia’s T-14 Armata FRCV is a key contender for the deal that is likely to be priced at over USD 4.5 billion. This development came after Indian Army Chief General Bipin Rawat started his six-day visit to Russia on Monday, in what is being seen as an attempt to lend impetus to the bilateral strategic partnership. The visit coincides with a bilateral annual summit scheduled for October 5 in New Delhi during which defence deals worth over USD 10 billion are likely to be signed. The Indian military delegation led by General Rawat is scheduled to meet the top brass of the Russian Armed Forces and key military formations and establishments. Russia's T-14 Armata FRCV is likely to figure in the discussions between the two militaries. A statement by the Indian Defence Ministry read, "The visit is yet another milestone in giving impetus to the strategic partnership between India and Russia and taking forward the military to military cooperation to the next level." Besides visiting the Mikhailovskaya Artillery Military Academy, the Headquarters of Western Military District in St. Petersburg and General Staff Academy, the Indian delegation will visit the headquarters of a motorised rifle division in Moscow. The procurement process for FRCVs was initiated by the Indian Army in November 2017 as part of a plan to induct hundreds of armoured vehicles similar to the Russian T-14 Armata, Ukrainian Oplot, and South Korean K2 Black Panther main battle tanks. According to the proposed procurement plan, the FRCVs will be manufactured in India by a private company in collaboration with the overseas original equipment manufacturer. General Rawat is also likely to discuss the maintenance and lifecycle support of Russian-made military platforms in India. Didn't see that coming but it makes sense. I don't understand India, I definitely don't understand Indian procurement policy but one thing is obvious. They will maintain their independence and they will NOT fall into anyone's camp. In a way its very refreshing. For a casual observer like me its apparent that their own national interests come first. They will work with any and all if its in their interests and it doesn't come at a prohibitive cost. They are VERY aware of the traps that can be laid if they were to "sole" source military equipment and will not tolerate the dangers that come with it (ie arms embargoes). I did not see them going for the Armata or even considering it but like I said before...it makes sense. The Armata in many ways has the potential to be the most advanced tank in the world for at least a decade or two. Even better for the Indian Govt is the fact that they could get in on the ground floor, gain production rights and have a beast that can tame anything from China or Pakistan on their borders. India is playing this smart. Russia needs them for funding of this program and they need a world class tank. I see Brahmos part two in the making...only this time with ground vehicles. Side note. This could be a game changer. If the Indian Govt bites on the Armata and say the Boomerang then we can see those programs accelerate. This bears watching gents!